Ahhh Amicus. I love your sordid little anthology films. Just seeing the names Milton Subotsky, Max Rosenberg, and Freddie Francis makes me smile. The funny little touches, the simple linking story, and the superb casts combine to entertain me more than any other horror films of the period. Maybe it’s my short attention span, but I love these stories. In Dr. Terror’s House of Horrors, six men meet in a train car. One of them, Dr. W.R. Schreck (Peter Cushing) has a set of tarot cards and claims he can tell the future of anyone who taps his deck three times. 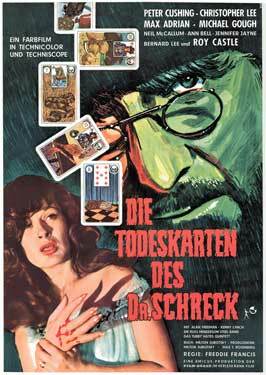 Schreck, which in German means terror, reads three cards for each man to tell his fortune, a fourth to determine his fate, then a fifth, which will divine whether or not the man can alter his future. In the first story, “Werewolf”, architect, Jim Dawson (Neil McCallum) travels to a remote island in Scotland to renovate his old house. While exploring the basement, Dawson finds a coffin full of Count Cosmo Valdemar. One of Dawson’s ancestors killed Valdemar hundreds of years ago and the Count holds grudges…even after he’s dead. Apparently, Valdemar is coming back to life as a werewolf. Dawson knows his stuff so he melts down a silver cross to make anti-werewolf bullets. Things don’t go as planned. “Creeping Vine” tells the story of a robot that eats children. Actually, it tells the story of a creeping vine. I can’t put anything past you. This is no ordinary ivy plant. This vine is a killer. Even the marvelous Bernard Lee can’t stop it. All I can say is the British are too polite. A little well-place poison or a flamethrower would do wonders. This part has a cool ending. “Voodoo” involves a trumpet player in a jazz quintet, Biff Bailey (Roy Castle) who hears a cool tune while visiting the West Indies. He decides to steal the song and call it his own. The people who actually wrote the song don’t like it. Franklyn Marsh (Christopher Lee), who isn’t buying any of Dr. Terror’s tarot tales, stars in “The Disembodied Hand”. In this segment, Lee plays a nasty art critic who insults the artwork of Eric Landor (Michael Gough). Landor makes a fool of Marsh and then taunts him relentlessly. Marsh has no sense of humor so he runs Landor over with his car. Hands go missing and soon Marsh is getting an unexpected back rub while driving. This almost never ends well. The last story, “Vampire”, stars Donald Sutherland as Dr. Bob Carroll. Dr. Carroll moves back to his New England hometown with his new wife, Nicole (Jennifer Jayne) to start a practice there. A series of mysterious illnesses and deaths convince Carroll to look for a vampire. After consulting with the other town doctor, Dr. Blake (Max Adrian), the men decide to take action. I love the twisty ending to this tale. As in most of the Amicus portmanteau films, we switch back to the linking story between segments and at the end. The template, laid out in Dead of Night (1945) works a treat. This was the first of the Amicus anthologies and it’s fun. The pace drags in parts, but the last two segments and the linking parts make up for it. Also, Christopher Lee and Peter Cushing!